Good questions - wish I had more marlinspike experience. 2. Then secure the slack anchor rode, so that if the loop lets go, you're still fixed. Construction workers used to use a “Triple Sliding Hitch” (or Prusik Sling) to secure a safety-belt lanyard (life-line) to a rope. The hitch slides in one direction, for easy adjustment, but not in the other (the direction of pull). They are generally being replaced by Rope Grab Devices in Construction; but I still like it. The diagram (at above site) is not quite correct, in that (I believe) both sides should have three (3) turns around the static line (Rode, in our case). Mechanical rope "grab" devices are intended to stop a worker falling along the lifeline in the shortest distance possible. Most of these devices operate on a "cam" action or roller principle, where the device "grabs" securely. I have not seen a "rope grab" device that I would consider durable enough for the marine environment. Most have plain steel in the cams and hinge pins. Perhaps there are some with better materials than those I am used to seeing. The prusik sling may work, but I would be concerned with slippage when the rode is slack. It shoud tighten when a load is applied, but if it goes slack then the boat slowly drifts aorund, it could allow the line to slide through. However, the prusik sling is a great way to assend a mast. I have used it several times to climb a halyard that is made fast at both ends. Then I use a second halyard as a safety backup with one end taken up around a winch. The climbing goes quick once you get a rythmn going, and you don't have to be yelling commands to a person on deck. It can also be used as a belay on a spare line if someone is hauling you up with a winch. Someone wrote that no anchor will reset very well. I must disagree. Not only will the Bruce reset IF it pulls out, 99% of the time a 180° wind shift simple rotates the Bruce all the while it remains buried. I got rid of my Danforths after 180° wind shifts put me on a beach twice. After I bought the 22lb Bruce that we use on our Cape Dory I went below and watched the anchor while my wife used the engine to swing the boat 180° and pull hard from the new direction. I was amassed to witness the Bruce simple pivot while remaining buried. A Prusik will work on both line as well as chain. It takes some dexterity with the boot hook to loosen and move a prusik on a chain yet can be done. It is much easier, of course, to loosen and move a prusik on line. The knot and bend experts claim that the line used to attach the prusik should be 1/2 the diameter of the line to which it attaches (or less) yet I have had excellent success using 1/2 inch snubber line on 9/16 inch rode. The prusik will not move when the line goes slack as long as you "set" the prusic with a good pull. What happens is that when the rode goes slack the prusik has sufficient tension so as to cause a bend in the rode along the length of the prusik which prevents movement along the rode until/unless you "knock" the main loop away from the set in order to slide or remove the attachment knot. To my knowledge there is no other knot that will do this job as well. One great benefit to using a snubber or bridle with a prusik is that there is no metal to corrode or to bang into the boat and it can be attached or removed with one hand once one becomes proficient with this knot. But at least when I learned the prusik, for climbing, it was never really supposed to hold when slack. Either you had pressure on it, or you had released--in which case you wanted it to move easily for the next set. With 1/2" or 5/8" jacketed line, prusiks can even be used directly to climb a tapered spar, street light pole, etc. But using them on an anchor CHAIN?? That's gotta count as abuse. Gezzz.. Gord you must be planning on doing serious hurricane research with that anchor rode sizing. That's a heavy duty system on a 40fter. No nites doing anchor watch with that lot I suppose. I'd go with the prussic for the bridle. I would stay clear of those rope clutches. We do a lot of rope work for Arbourists and having had a good look at a few I doubt they would stand up very long on an anchor rode. Maybe for lite duty only with a good look over after each use. I think the constant cyclic loading would just kill them quite quick. Some are hard on the ropes as well. Use 1/4" transport chain. Get rusty mess on decks very fast or you could galvanise it but then, at very best, you would only have a G4 to G5 chain anyway. If the bloke running the bath is not good you may end up with nice galvanised chain with a break load of 500#. Chain below 5/16" should not be seen in an offshore boat above 25ft. Use a Fortress. Seen far to many bent and broken. My personal choice people and I defend the right for any of you to use anything you like, before this thread drops off into the 'Oh yes it does - Oh not it doesn't' anchor type abyss' :-). I use another sort of Alloy anchor. Use a 'bruce type' anchor, I would use a Bruce though. We used to sell the knock-offs but have stop due to the dodgy construction and geometery seen in most copies. When I finally get my lawn decoration of 12 years ready to float, what anchor works best in the Great Lakes area? I have a Danforth but have read that these don't set in grass very well and they won't reset. I have considered carrying an additional anchor of the Bruce type. What would you folks recommend as to anchor type and most common rode length ? Not a Danforth, you have read right, although they may set okay in grass - just not re-set very reliably. And not a claw (Bruce) or plow (CQR) either. They will not set at all reliably in grass. Suggest you look at the newer designs of anchors available. Particularly Spade, WASI, Rocna, and Bulwagga. The latter two in particular have sharp low profile flukes that will cut through grass and weed. No anchor will really re-set, in a new direction, properly. You will want to set multiple anchors, to account for directional pull changes. Not true, this is indeed one of the failings of older types but has been largely successfully addressed by newer designs. A good design will not release upon a veer of force, and even if it does, will re-set immediately owing to the characteristics that make it a good performer at setting in the first place. To set multiple anchors or not should depend on the anchorage and specific situation, and is to be avoided if possible, and not recommended simply because the wind is known to change direction. Anybody know what these should be called? Danforths on stearoids? 3. Given my two anchors, and that it is a cat, and that I am bound for the Caribbean, what would you choose (and what weight) for the third anchor? "The gallery is closed" so not sure about your existing anchors. If they are Danforth-types, they are not ideal to be used as primary anchors anywhere. 3) Assuming the above, save your cat some weight, get rid of one of them, relegate the other to a stern anchor or auxillary, and look at more serious alternatives to be used as your main anchor. Delta, Spade, Rocna. But weight is not all that's important. Fluke area is the only factor that dictates holding power, once set. Still interested in everybody's opinion on my plans, but, SJS's comment on fisherman's anchors gets my attention. I have noticed those fishermans anchors that break down into pieces, and they seem a neat option for a third anchor. Anybody try these? Fisherman's type anchors are very out-dated and offer very inferior holding power. As CSY indicates, useless in sand and grass. Avoid. Quickset anchors are inexpensive and are a good delta type anchor, made in Canada. So, if you decide on a fixed shank plow, then get a Delta (Lewmar). Good idea getting rid of the Danforths. As stated above, not to be used as serious primary anchors - that's one of the reasons. But I disagree about the Bruce. The problem with claws is that they're very unpredictable. While your experiences might be valid, it doesn't make it the case for all situations. In fact claws are very unstable, rolling out if pulled beyond yield (rather than remaining embedded), and if used on hardish sand, may not set properly at all (so a wind shift may dislodge the anchor, after which it will lie on its side and not re-set). Previous comments advocating not using Danforth anchors as primary anchors are ill-advised. Danforth anchor designs have NEVER been sold as an anchor which will reliably reset without first pulling them up to make sure that they are not fouled. In my opinion there is no better anchor to save your boat from going to destruction due to wind and waves placing huge forces against the hull, especially in short-scope situations. The key here is that one cannot use a Danforth type anchor as a primary one if the boat will shift more than 120 degrees when laying to an anchor regardless whether the reason is due to wind, wave, or tide shift. I carry two high-tensile strength Danforth anchors, one Bruce, one CQR and a folding Northill and still wish that I could carry the huge requisite weight of a fisherman (which should be about twice the weight of the CQR). A fisherman is a good rock hook yet most people overlook the fact that ht Danforth anchors are also good rock anchors. When using a Danforth as a rock anchor one may never get it back up again yet, in a survival situation, who cares? They will bend and distort when wedged in rocks but not break or yield. Anchoring bow and stern or with a two-anchor bridle a Danforth is unbeatable in most bottoms and has saved my boat from being dashed against a cliff in heavy wind and swells when I should not have been there for long in the first place. Beware of several of the "newer" anchor designs hitting the market in the last few decades as their advertising is not inclusive in revealing their failings under a wide variety of conditions that the older proven designs with known attendant shortcomings under known conditions that can be planned for in advance (like not swinging on a Danforth). A well-balanced reminder, Rick. There is no anchor panacea: carrying a carefully chosen spectrum of anchors for different situations, and deploying them in varying combinations to fit those (expected) conditions, is still the most prudent seamanship. Yeah, a Danforth doens't like grass, and there's the swinging/resetting issue mentioned above by Rick. Ergo, a Danforth and Bruce is a good basic anchor wardrobe. The "conventional wisdom" is 5:1 scope for all chain, 7:1 for chain/nylon rode, as a rule-of-thumb. Of course, that's subject to conditions, swinging room, and your own biases. What about 90 degrees? 45 degrees? Furthermore Danforths are not roll-stable. This means that if they start to move at all, they will pop out. A good anchor will remain embedded and the resistance will increase, not drop to zero! So even if it moves a little during a strong gust for example, it will remain secure. Wheras the Danforth is skating along the seabed. 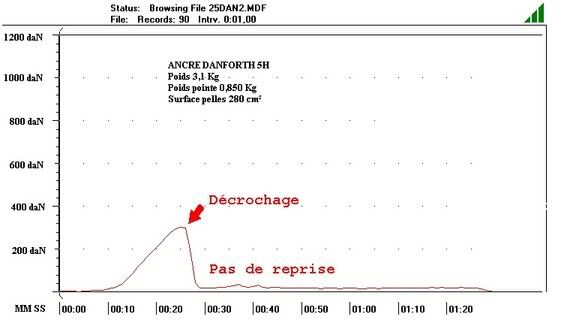 That is the typical result of a straight line pull test that should demonstrate why a Danforth should never be relied upon as a primary anchor, unless you are willing and able to deal with the anchor dragging. A fisherman is a good rock hook yet most people overlook the fact that ht Danforth anchors are also good rock anchors. When using a Danforth as a rock anchor one may never get it back up again yet, in a survival situation, who cares? They will bend and distort when wedged in rocks but not break or yield. I'm not sure what your point here is. A Danforth will bend and distort, perhaps fail, and that is a good thing? Any anchor will hook up on rock just as well as a Danforth, and many are far stronger and able to cope with it. Even the amateur fisherman in his 3 meter runabout knows to use his grapnel over rock, and save the Danforth for soft stuff. How do you know it is "unbeatable"? Have you tried other anchor types and experienced your boat being dashed against the cliffs, from which you might rightfully conclude that it would have been a better idea to use the Danforths? I will ignore the lack of logic that brought Bruce into your argument, but how many anchors do you want to carry onboard. Our ideal is a general purpose anchor that addresses the failings of the old traditional plows and claws, provides excellent performance in everything from very soft mud to very hard sand (all extremes), cuts through weed and grass, is strong enough to deal with being fouled or used with rock or coral, and so on. The argument of carrying a claw, plow, Danforth, and fisherman's, each to address the problems of the others, is nonsense nowadays, because it is possible to consolidate the weight into perhaps two anchors that will more reliably and safely meet all requirements. More may be carried as required, but are not needed to compensate for the poor aspects of the others. We know from experience that a Rocna will be happy in ALL conditions (except rock, for which this is no ideal anchor - use a grapnel and be prepared to lose it). But we are biased and you may choose not to believe us - although certainly, any other new generation type, such as Spade or Bulwagga, will do you better than the traditional types. Period. Craigsmith I apologise for not writing in a more clear manner. There are several of us contributing to this forum who have no insubstantial varied and deep experiences with anchoring. I set my first Danfort in 1951 and since then have used many different anchors under a wide variety of conditions including anchoring in hurricane force winds and several times anchored in tropical storms, often on a lee shore due to wind shifts from the eye passing. I state unequivocably that there is no ideal anchor and, therefore, your anchor is not ideal. Even you admit that it is not a "rock anchor". The so-called newer generation of anchors, such as the Bulwagga or Spade, or Barnacle will not be superior in all conditions (and have not proven to do so) to the time and condition tested standards the Hershoff, CQR, Bruce and Danforth type anchors. Now don't go off on that last statement. To be sure there are some conditions which each one of those might be better than one of the old "standards" yet there are definitely some conditions where each the old "standards" are superior to the new ones. Even the Practical Sailor test results show that to be true if one carefully examines the data. There is no reason to expect the Rocna to be any different in that regard. Please take no personal offense but you clearly have not much credibility due to the fact that you have a conflict in interest between objectivity and profitability. I believe no comparison data brought before me by someone standing to receive financial gain by the results. You cannot successfully argue the the Danforth will roll out and fail to hold when there are many many years and users who have experienced the contrary, even the Practical Sailor article showed that the Danfort would reset on a 140 degree shift in 1 foot. That is more than the 120 degrees of what I call a normally acceptable swinging angle for that anchor. That article clearly shows that the "old standards" each have a good application for holding and that is why I use all of them. Until I receive objective testamonials regarding your anchor I remain beyond skeptical that a cruising sailboat can get away with only two types of anchors in all conditions. I am not alone in claiming that the Danforth, Herrshoff, and fisherman are good rock anchors. Cruisers should carry an anchor that will hold them off of a lee shore in rocks. Yours is not one of them apparently. When I mentioned the fact that the Danforth will bend or twist before breaking that is a GOOD thing! We are talking here about conditions which are close to the maxmimum rating of the steel and well beyond "normal" anchoring conditions. I have seen radically twisted and bent CQR and Danforth anchors that were caused by survival conditions that I submit you have never experienced. The anchors held and did not break. One of the CQR anchors I had straightened in a machine shop with a large hydraulic press and it is still in use today. That is what good drop-forged steel will do for you. As a final note I believe it to be possible that Wheels probably has improved upon your design as he claims. The first thing that I would do is do something to the design to get rid of that round hoop. Why design that in in order to help the anchor dig in when it otherwise might always be on its back? Why not use a CQR or a Bruce which do not require such an appendage in order to set and reset reliably? My stance is that anything heavier than water attached to the end of a chain will work better than nothing and, therefore, ANY anchor design may work yet NO anchor design will work under all conditons and, furthermore, no TWO anchors will work under all conditions combined. Proove me wrond with some credible source material not associated with a manufacturer. Your statement that there is no ideal anchor is based upon your experiences with the exact anchor types that have provided the motivation for us to design a new one. I can honestly state that I cannot think of a scenario where a plow or claw may be a better choice than a Rocna (I am being specific to Rocna now to eliminate any possible flaws in other designs). No matter what the situation, the newer design will handle it better. Period. I have no experience with the Barnacle, it doesn't look very interesting. But much of Practical Sailor's recent tests, like most magazine testing, is a waste of time. They consider nothing like the full range of factors that should be accounted for, and frequently come up with nonsense results, such as recent conclusions that an anchor holds better the less scope being used. Why not? Of course you're right to be cynical and wary of biased claims, but you have no right to reject in absolute terms anything that you haven't had experience with yourself. You cannot successfully argue the the Danforth will roll out and fail to hold when there are many many years and users who have experienced the contrary, even the Practical Sailor article showed that the Danfort would reset on a 140 degree shift in 1 foot. Yes, I can, and I have posted an example of independent test data to back it up. This is entirely objective, because I don't really care in this context if you use a Rocna - or Delta, Spade, or whatever, just so long as you don't consider a Danforth to be a serious primary hook. The issue is not that they NEVER re-set, it's that they're too unreliable at doing so. Their behavior is inconsistent. Well you might not be alone in claiming that the world is flat, but consensus should never decide science. Let's be clear: there is no such thing as a "good rock anchor". Fisherman styles and grapnels are your best bet if you must anchor over rock, as they are more likely to hook up in crevices or around a boulder etc. When I mentioned the fact that the Danforth will bend or twist before breaking that is a GOOD thing! We are talking here about conditions which are close to the maxmimum rating of the steel and well beyond "normal" anchoring conditions. I have seen radically twisted and bent CQR and Danforth anchors that were caused by survival conditions that I submit you have never experienced. The anchors held and did not break. There is no logic to this statement. My point is that a Danforth has nothing like the strength of a more solid anchor - such as a Rocna, but also such as a drop-forged CQR, yes. You are saying that it's a good thing that the Danforth bent before failing - well, sure, in the context of a world with nothing but Danforth-style anchors, but that's a characteristic of the metal and are we arguing materials engineering or anchors? The Danforth has bent and twisted, and possibly failed completely, way before the CQR or Rocna has. Drag the Danforth across coral littered bottom, strike a fluke against something hard, and it will never set again. As a final note I believe it to be possible that Wheels probably has improved upon your design as he claims. The first thing that I would do is do something to the design to get rid of that round hoop. Why design that in in order to help the anchor dig in when it otherwise might always be on its back? Why not use a CQR or a Bruce which do not require such an appendage in order to set and reset reliably? You hear that Alan? Best improvement you can make: remove the roll-bar. My stance is that anything heavier than water attached to the end of a chain will work better than nothing and, therefore, ANY anchor design may work yet NO anchor design will work under all conditons and, furthermore, no TWO anchors will work under all conditions combined. I do not understand how you get from the revelation that something heavier than water will work better than nothing, to your conclusion. It revolves around the assumption that no anchor design will work under all conditions. Well I state from experience with the Rocna that you are wrong, but as you say I am biased, and you may choose not to believe me.